#Kitsch #Spotted : Kareena Kapoor attended Singham 2 promotions, looking suave in a simple T shirt-denim outfit with #SaintLaurent Tribute heels! ‪#‎Kitsch‬ ‪#‎Spotted‬ Chrissy Teigen looking swell in a bright ‪#‎RachelRoy‬ outfit, at the CFDA! We love it, what about you? #‎Kitsch‬ ‪#‎Spotted‬ Dree Hemingway looking wild, at the CFDA, in ‪#‎DianeVonFurstenberg‬! ‪#‎FlashbackFriday‬ Kangana Ranaut dazzles in this all-white ‪#‎VictoriaBeckham‬ dress! Take your pick from the dresses, at ‪#‎Kitsch‬! ‪#‎Kitsch‬ ‪#‎Spotted‬ Sophia Bush going all vintage with a short hair do and a gorgeous ‪#‎Marchesa‬ dress! Kajol pairs up her blacks with this sophisticated white #AliceAndOlivia shirt! TV star Beth Behrs in #AliceAndOlivia at the CFDA, New York! Do you like her all green look? We #Spotted Sonam Kapoor working a preppy look in a pair of leopard print #DocleAndGabbana pumps! What would you wear these with? The #CFDA in NYC, saw #DianeVonFurstenberg dressed in her own label, on the #RedCarpet! What do you think of the designer’s get up? #ThrowbackThursday! 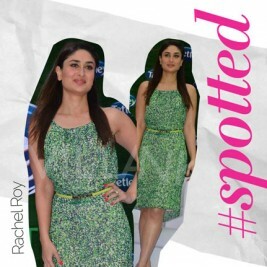 Kareena Kapoor was #Spotted, in a printed #RachelRoy dress at a launch event, earlier this year. What’s your take on her look? #Kitsch #Spotted Deepika Padukone looking gorgeous in this hot #StellaMcCartney maxi dress! #Kitsch #Spotted : #BeeSchaffer wore this impressive and detailed #DolceAndGabbana dress to the 2014 CFDA Fashion Awards! Who can say no to #RitaOra ‘s delicious dress from #Chloe? Come and check out the Chloe collection at #Kitsch stores, ladies! #MirandaKerr never disappoints, does she? #Kitsch #Spotted her in this stunning #VictoriaBeckham dress at a promotion event! ,p>#JessicaAlba looks like quite the southern belle in this outfit, carrying a #SaintLaurentParis bag! The pretty #AliaBhatt was #Spotted carrying an #AlexanderMcQueen clutch to one of her recent outings! #SalmaHayek is a vision is a deep pink gown by #SaintLaurentParis. Isn’t she lovely? #Kitsch #Spotted our very own #PriyankaChopra flaunting her flawless torso in a navy #StellaMcCartney top! Yay or nay? We can’t get enough of the First Lady’s impeccable taste in Fashion! 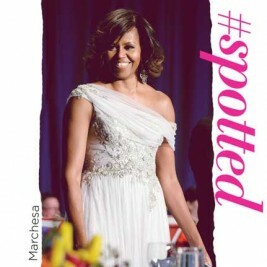 Here, #Kitsch #Spotted her looking serene as ever, in a white #Marchesa dress. Do you like #MichelleObama ‘s look? 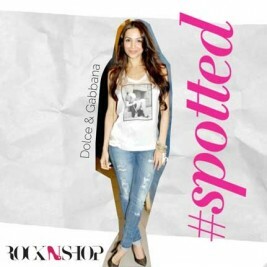 #Kitsch #Spotted : #MalaikaAroraKhan goes street chic in this #DolceAndGabbana Marilyn tee! What would you wear with this cute T-shirt?? #Kitsch #Spotted the beautiful #KatrinaKaif in #AliceAndOlivia. #Spotted Elettra Rossellini Wiedemann going double trouble in a Chloe duo- Dress and clutch! What chloe item is your favourite? #Kitsch styled #DiaMirza in a beautiful pastel number by #HalstonHeritage and #SahilSangha in #DolceAndGabbana for a recent event. What do you think of the duo’s looks? #Spotted Aishwarya Rai keeping it simple, carrying this summery #VictoriaBeckham bag! What are your summer essentials? #Kitsch #Spotted Rosie Huntington-Whiteley with a Saint Laurent Sac De Jour tote at the LAX Airport. #Kitsch #Spotted Cameron Diaz wearing Victoria Beckham at the London Premiere of The Other woman. 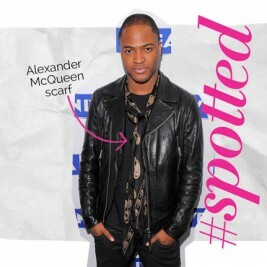 #Kitsch #Spotted Taio Cruz wearing a black Alexander McQueen scarf. What do you think? #Kitsch #Spotted Emma stone wearing Jason Wu for The Amazing Spiderman 2 promotions in Italy. #Kitsch #Spotted Carmen Electra working a Hervé Leger studded strapless dress along with a McQueen clutch. Would you try this look? #Kitsch #Spotted the Saint Laurent Belle De Jour clutch on Rita Ora. What do you think of her all-grey look? #Kitsch #Spotted Emma Roberts wearing a Chloé dress at the recent Newyorkers For Children event. #Kitsch #Spotted Leslie Mann in Stella McCartney cropped trousers with Saint Laurent pumps. #Kitsch #Spotted : #EmmaRoberts pulled off a fun look, pairing up a Floral dress with a pair of #Chloe Flat studded boots. Taylor Swift was #Spotted with the Dolce & Gabbana Large Agagta Shoulder bag. #Kitsch loves it! Do you? #Kitsch #Spotted Uma Thurman in a shimmering white Marchesa gown, at the Cannes Film Festival 2014. #Kitsch #Spotted Legally Blonde star Reese Witherspoon shopping in Alice & Olivia Daphney Ballet flats! How would you wear these? #Kitsch #Spotted J-Lo going rocker chic in a Rachel Zoe Spencer Geo Eyelet jacket on Jimmy Kimmel Live! What do you think of her all-white look? #Kitsch #Spotted rapper queen Nicki Minaj wearing a simple Alexander McQueen maxi dress at “The Other Woman” screening in LA. #Kitsch #Spotted Andrew Garfield, looking dapper in a 2 piece Blumed Check Suit by Alexander McQueen, at the New York premiere of The Amazing Spiderman 2! Kate Upton #Spotted looking very #Kitsch in a Dolce & Gabbana strapless number for “The Other Woman” screening in Westwood, California. #Kitsch #Spotted this pretty floral Dolce & Gabbana dress on Sonam Kapoor at IIFA 2014. What do you think of her outfit? #Kitsch #Spotted, Richa Chadda at the IIFA awards, carrying one of our favorite Alexander McQueen clutches! #Kitsch #Spotted Priyanka Chopra, looking stunning in Hervé Leger at IIFA 2014! #Kitsch #Spotted Bollywood actress Dia Mirza in an orange Halston Heritage gown at the IIFA awards 2014! #Kitsch #Spotted Sonam Kapoor looking elegant in a Dolce & Gabbana Blue Brocade dress. #Kitsch #Spotted Dia Mirza, carrying Stella Mccartney during the IIFA event in Florida. At Kitsch we have a range of delicious colours for you! #Kitsch #Spotted Kate Upton, looking gorgeous in Saint Laurent, at a film screening in New York. #Kitsch #Spotted Fashion icon Victoria Beckham looking smooth in Chloé. What would you pair these Sky Blue pants with? Pop Star Rita Orra was #Spotted carrying the Chloé Python Baylee Bag. Available in other colors at the #Kitsch stores.